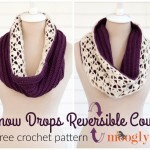 The Snow Drops Reversible Cowl… inspired a hat! 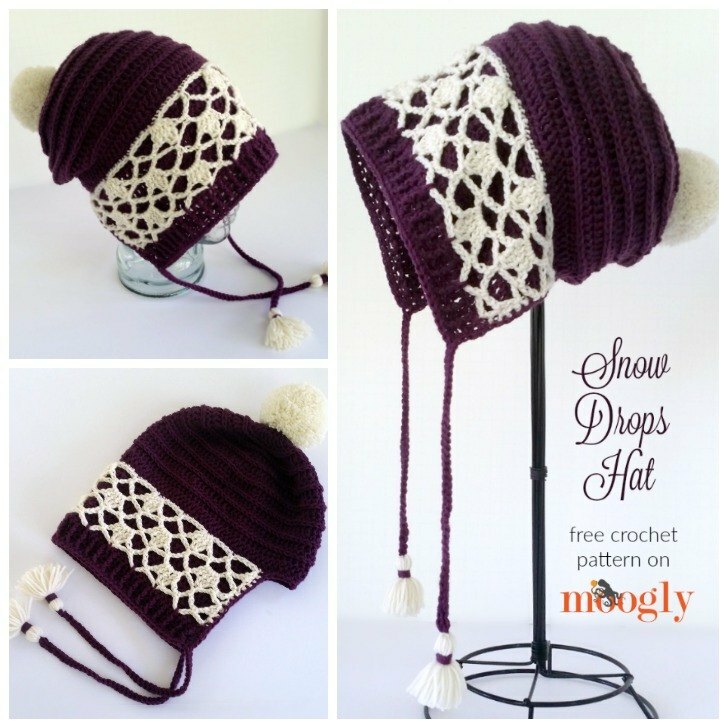 And while it isn’t reversible, the Snow Drops Hat is fun, fresh, and ready for any autumn or winter adventures on your horizon! The Snow Drops Hat is a slouchy beanie with an open brim – so popular right now, and it means the hat fits just about everyone! The lace portion is pretty and feminine, and the pom pom and tassels make it youthful and fun. 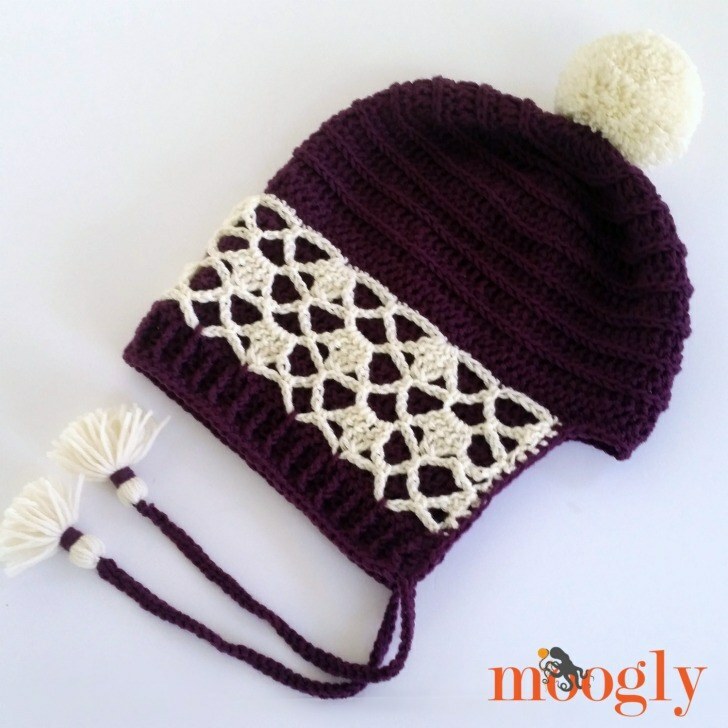 Overall, it’s the perfect hat to pair with the cowl – or wear on it’s own! This pattern is worked in rounds through Round 19, and then it switches to Rows. The pom pom and tassels are optional – but fun! See chart below for the Color B stitch pattern. Round 10 – 17: Repeat Rounds 8 and 9. Row 21 – 27: Ch 2, dc in each st across; turn. (61 sts) After Row 27, remove hook from active loop and place st marker in loop to secure. Row 7: Repeat Row 3, break Color B. Edging and Strings: *Ch to desired string length (shown: ch 41), skip 1st ch, sl st in each ch to end,** then sc along side of Rows, going through both Color A and Color B layers, sc across back of hat, sc along next side going through both layers again, then at corner repeat from * to **, then sc in each st of Row 30; join to 1st ch and break Color A. OPTIONAL: Add pom pom (Color B) and tassels (Color B with Color A accents) if desired. Follow package directions, then sew to hat as shown. And that’s a hat! 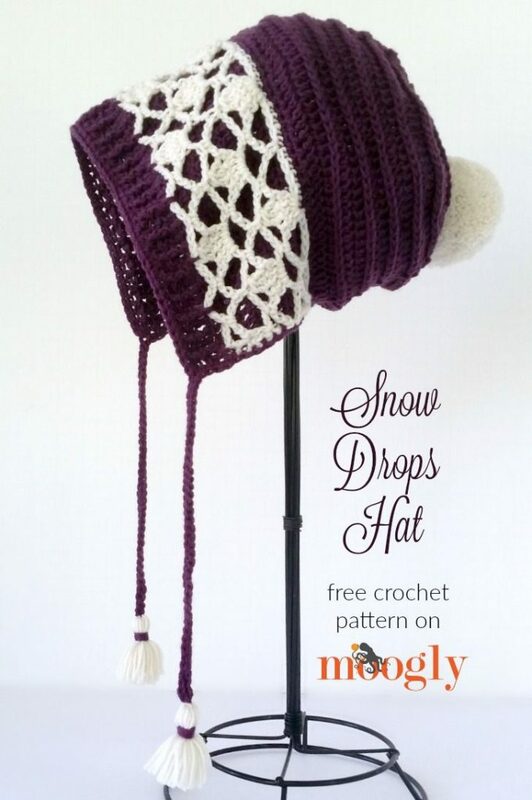 A Snow Drops Hat to be precise, the perfect accompaniment to the Snow Drops Reversible Cowl. 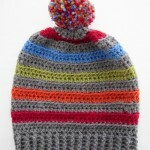 The hat isn’t reversible, but it does show off both patterns to great advantage – and makes a wonderful gift set! 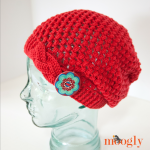 I hope you enjoy both of these free crochet patterns! Written pattern copyright Tamara Kelly 2016, all rights reserved. Please do not reprint or repost this pattern, but please do link to this page to share this pattern with others. To print or download, use the Print Friendly button below. If you wish to make items for sale from this pattern, or translate it to another language, please visit the About page for details. Thank you to Lion Brand Yarn for providing the yarn for this pattern! That is an extremely cute hat! That is adorable! Like a prairie sunbonnet, only warm! In round 2 of the hat it says dc around then it says 24 sts. Did you mean 2dc around? Yes! My apologies, typing too fast. 🙂 I’ll update the pattern now! And thanks to the knitting diagram becomes simplified. I have made two of these now in the past few days… obsessed! Thank you for the awesome pattern! 😀 Thank you so much Gabby! This would make the CUTEST EVER baby hat! I suppose if I download those templates (from another of your posts) I’d be able to figure out the sizing? Thank you for your inspired patterns! Hi, love all you do. Thanks. When we start the lace you say “row 19” that should be round 19? Thank you so much, Becky! Yes, good catch! Sorry about that, thanks for letting me know! My comment above was my first comment EVER on any blog. I just have to tell you these hats are a hit!! I have made 7 so far and have experimented with different lace patterns in the front. All the girls at my shop want one. This sure has kept me busy. Thanks again for all you do. You inspire so many. One quick question, do you have any links to charts that would work in place of the snowflake lace? TIA. 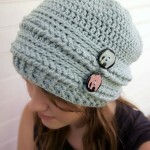 BTW, I’d love to send you a pic of the hat I did with skulls. I absolutely love this pattern. This hat looks so cool. Can’t wait to make my own and wear it next winter. Will definitely give it a try. This is absolutely adorable and looks fairly easy. 😀 I’m going to try and make these for my aunts and grandmas since I know they’ll love it. Thank so much for sharing!